Hardwood Flooring and Radiant Heat Systems: Which Material Is Best? When it comes to efficiency and effectiveness, radiant heat systems are great. But when it comes to hardwood flooring, they can do some pretty serious damage. Hardwood flooring is more likely to dry out faster when installed over a radiant heat system, and overly dry flooring is just as prone to damage as flooring that has too much moisture. There are, however, certain types of hardwood flooring materials that work better with radiant heat systems and are less likely to experience the same kind of damage. Here are the best hardwood flooring materials to install over radiant heat systems. Narrow boards are generally more dimensionally stable than wider boards, meaning they will bend, buckle, and warp less when installed over a radiant heat system. As a general rule of thumb, using any width under 3” works well. The preferred width is 2 1/4”, especially in solid flooring. Again, the important factor with this type of flooring is dimensional stability. Quartersawn floors and rift-sawn floors are more stable than their plain sawn counterparts. There are many reasons engineered hardwood flooring is preferred over solid hardwood flooring: it's versatile, it's relatively easy to install, and it can be installed in almost any room in the house. Engineered flooring is also the preferred choice when it comes to radiant heat systems. The dimensional stability of engineered flooring makes it a perfect pairing with radiant heat. Engineered hardwood flooring is a great material to use over a radiant heat system. For more information on installing hardwood flooring over radiant heat systems, contact Wood Monsters today! Hardwood Flooring and Bathrooms: Which Species is Best? The beauty and durability of hardwood flooring has made it an enduring favorite of builders and homeowners for just about as long as there have been floors. But there’s one room where, historically, hardwood has been afraid to go. We’re talking, of course, about the bathroom. Mention your dream of having hardwood flooring in your bathroom and the old-timers will give you a skeptical look: moisture and wood don’t mix! You’re asking for trouble. It’s true that damp conditions can be bad for an inferior, poorly-sealed hardwood flooring installation. However, a properly-installed hardwood floor can work just fine in the bathroom, particularly if you use the right kind of wood. 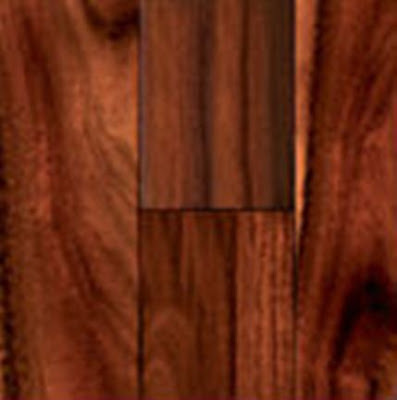 Enter cumaru hardwood flooring. This exotic South American hardwood has an exceptionally dense cell structure that helps it resist moisture and the bacteria that can break down more porous woods over time. Initially popular in the US for use in outdoor decks, cumaru hardwood flooring is now finding a receptive audience among folks who’ve longed for the warmth and good looks of hardwood in the bathroom, but thought it couldn’t be done. Now, though, it can! Contact your Wood Monsters rep to learn more about how cumaru hardwood flooring can put the crowning touch on your home’s baths. Opening all the windows and doors will increase the airflow in your house and help speed the drying process. Make sure to do this only after the flooding has stopped - you don't want to make matters worse by letting more water in. 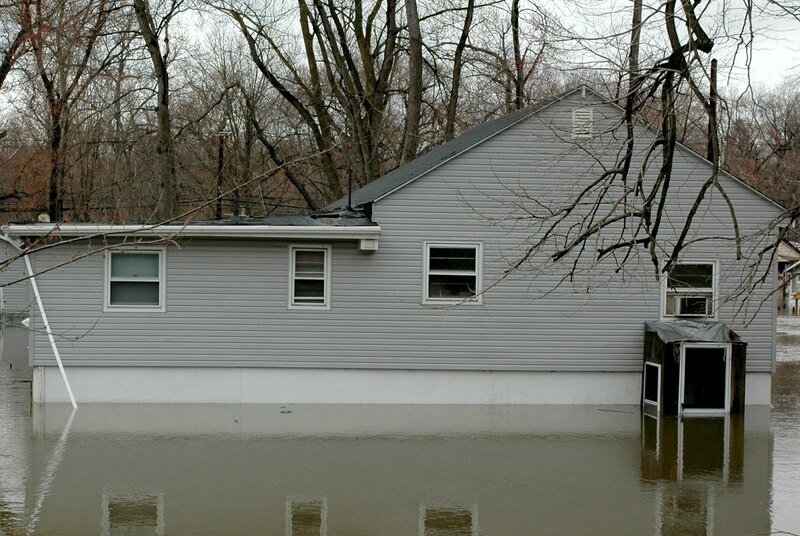 Get rid of any remaining dirt, mud, water, or debris that may have come in during the flood. Letting this dirt and debris sit on your floor will encourage staining and mold growth, so get rid of it as soon as you can. Make sure to wear protective gear, like heavy gloves and boots; you never know what might have floated in during the flood. 3. Clean the floor some more. After you've cleaned up the mud and debris, it's time to get into the nooks and crannies. Using a non-abrasive brush and a non-sudsing detergent, clean the floors' cracks, grain, and any other surface area that still has dirt and debris in it. This will help reduce staining and mold growth. Use clean, clear water to rinse the floor once you're done. 4. Safely dry the floor. Wait for the power company or governmental officials to give you the "OK" to turn your power back on. When it's safe to do so, turn on your furnace and space heaters to get the house temperature between 75 and 80 degrees Fahrenheit. Heating from the basement up is the preferred method, especially if you have hardwood flooring on multiple floors of your home. 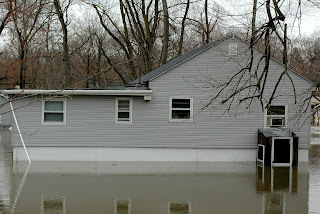 If you're working with a professional flood restoration company, they should provide special fans, heaters, and dehumidifiers to help speed this process. Don't kid yourself - there will most likely be damage to your floor. The best you can hope for is that the damage is minimal enough that you can refinish the floor boards and not have to replace the whole floor. The most important things to look for are cupping, crowning, warping, buckling, finish damage, and mold growth. If you notice any of these - and again, you probably will - it's best to call a hardwood flooring professional. They will be able to determine the exact extent of the damage and handle the refinishing or repairs. Unfortunately, the drying and repair project can take weeks or months to finish. No repairs should be attempted until your floors have reached normal moisture levels. A hardwood flooring professional will be able to tell you when your flooring is reading for repairs. To learn more, visit Flooding and Hardwood Flooring on the Wood Monsters website. It’s time once again for our regular series on the Wood Monsters blog, Wood Monsters Featured Items. You may recall our last installment was about Engineered Brazilian Cherry. Today we’ll be talking about another engineered flooring product: Hand Scraped Pacific Walnut. Like all handscraped hardwood flooring, Wood Monsters’ Pacific Walnut hardwood flooring is sculpted by hand to give the look of a reclaimed, vintage hardwood floor. But since it’s an engineered product, it’s more resistant to humidity and easier to install on any floor of the house. As you’ll recall from our recent rundown on engineered flooring in general, just because the product is engineered doesn’t mean it’s not real wood! Engineered flooring is formed in layers, and the top layer that you see and walk on is real Pacific Walnut, with that hardwood’s characteristic coarse grain and straight or wavy tree markings on the individual boards. Because it’s hand scraped hardwood flooring, it has the dimensional stability and sculptured quality you’d associate with a lovingly maintained, century-old house. And because it’s Pacific Walnut hardwood flooring from Wood Monsters, you know it’s backed by our top-notch expertise and customer service. Don’t confuse this handscraped product with distressed products, which get their worn look from an automated wire brush. Because these boards are finished by hand, they have a warmth and character all their own. Visit our site to learn more about our wide selection of hand scraped Pacific Walnut hardwood flooring.